[Hall Of Shame] - Server owners do not hire this GM! I'm Chaos, the owner of Experience RO server. I'm here just to inform my friends owners of other servers, about some GM experience I had in my server, I asked to yC, where I could post it, and she said to me, this place is the one wheres it fit better. My intention is not to make a ranter circle or a flame post, so, Ill just post one GM and Ill show proofs of what I'm talking about, if you guys think it's a good idea to prevent others to hire those "GMs", do the same here. I don't think it need replys or anything else, its just to knowledgement, and maybe it become a reference before owners hire someone to be GM. Full name:Michael Fernandes Rodrigues (F.R). Position(s) desired:Event GM,Police GM(Bot Hunter) Or Support GM. Time Zone-Area:GMT -05:00 Canada And United States. Recently, I was trying to bring new life to my server, so I started to hire new GMs. I have a hard politic about hire new GMs, so all GMs to be, have a trial period of 30 days, not less. In this time, they all receive GM LVL 60, with restrictions. Some ppl can say its is not necessary, but Ill show to you all, it IS. I have received 24 resumes from ppl wanting to be a GM in my server, one of those was this guy Michael. I made one interview with him, and he sound ok to be in trial. So I inserted him on trial system. Also I inserted more 10 GMs to be. Its ok, all them was working nice. Till last friday, when one of my GMs to be, made his first event (a cool event btw). During this event, the Shiftragoon (in server he choose the name "BlackRose") just said in his GM account in the map of event: This event is stupid. I was in hide mode, since I'm GM LVL 100, others GMs can't detect me in hide, so I was there following the event and I was able to see it. I haven't said anything, but ok. So, when the other GM was making the event, he (BlackRose), just started to summon Maya Purples in GM HQ and kill all with @killmonsters and when the GM was making event, you was able to see: " won Maya Purple's Maya Purple Card (chance: 0.40%)"
After the event ended. I have a GM Group in MSN, so all GMs talk there, the GM who mad ethe event, complained to me, that the BlackRose was interrupting the event and all. I agreed, of course it was totally true, and so the BlackRose and the event GM started to "fight". After some time talking with both, I muted both in game, and talked with both on chat, so they agreed to forget everything and ok.
For me the "case" was over. So I went to bed, was my sleep time. When I wokeup, the first thing I normally do is check server, check forum, site, etc. So I did. When I loged on server I saw warps around all pronter (@addwarp). So players aren't able to stay in any place. The server needs restarted to get rid of all of the extra portals. BlackRose apparently thought it would be funny that, after you left, he would log onto the server via his GM account and ransack everything. After the quarrel that Frost and BR had, I thought things calmed down when BR wasn't responding with immature remarks to Frost. When BR said on msn "Hey log onto the server and look at the new decorations." I logged in and seen the entire map of Prontera filled with Baphomets. After I killed the bapho's in TC I was disconnected by server, at first thinking this to be an error because of the baphomets. So I warped to Morroc to stop the error where I was disconnected again. This is when I realized BlackRose was kicking me from the server. Knowing this I logged in and immediatly kicked him. Then I baned him for 1 hour so I had time to adjust everything. Thinking he might come back in an hour, I blocked him from the server. I'm sorry for blocking him without permission but I seen him as a danger to the server and I played the hand that was dealt to me. I quickly undid the gvg, pvp, and baphomets in Prontera, however I was unable to do anything about the warps located by TC. These warps lead to Louyang, and I tried many things to correct this issue. Apparently he didnt think to make a portal for newby spawns or kafra spawns, thankfully they spawn in a diffrent location. He only made a portal where GM's spawn with @go 0. I made a portal directly above this for anyone who dies so they would be teleported to prontera 156 180. Sorry I acted without consulting you but this was after you had logged off. 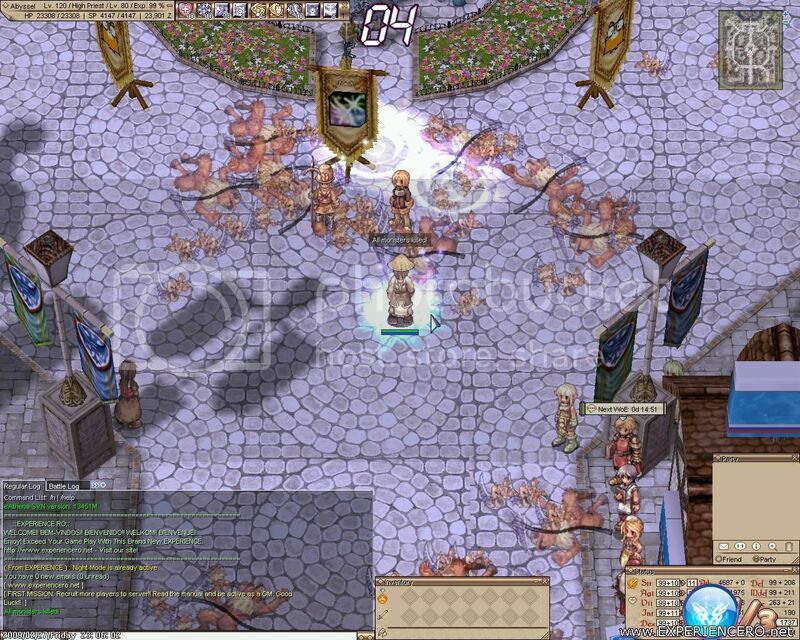 BlackRose said over msn he was quitting the trial and moving to a diffrent server and this is why he did this. After read that, I just opened the MySQL Querry Browser and deleted the BlackRose GM and Legit account. I checked all others transactions and events log and I saw theres none major damage than that. So the simple restart of server was able to solve everything (thats why GM LVL 60 for GMs to be is a best option). And now, I'm here to advice all of you, my server owners friends, about this person. I really DO NOT recommend him in any way. He is childshi, he don't have ANY maturity or ANY requeriments to be a GM. So, even if you are in one deadend and are looking for a GM, don't choose him. In the first moment, he will abuse of GM powers and will find a way to make your server have problems. As I said before, I'm not asking for replys, this post is more one type of advice. The damages could be a lot higher in server if this guy had more powers and if I had none other GM with atitude and maturity to deal with this troublemaker. Re: [Hall Of Shame] - Server owners do not hire this GM! Wowwwww. I KNEW something was up with that kid. And now people, we learned a valuable lesson. People that spam copy & paste resumes are bound to be corrupt. Quis custodiet ipsos custodes? Ut esset mihi. [ Member BlackRose ] : your event only had layla and ryu in it so whats the difference? [ To BlackRose ] : Someone else's event? [ Member BlackRose ] : bothers you? [ To BlackRose ] : I did not invite you to jump into my event, You jumped in. [ To BlackRose ] : were on their Legit accounts? [ To BlackRose ] : NOOOO!!!!!! Black!!! [ To BlackRose ] : THEN WHAT WOULD YOU SUGGEST? [ To BlackRose ] : Hmmm? [ To BlackRose ] : And how did you learn? may I ask? [ Member BlackRose ] : and then im the one with the dumb IQ? oshyin : nk g skg? [ Member BlackRose ] : brainless staff? [ To BlackRose ] : and I shall repeat my self, I am learning. [ To BlackRose ] : what? Shift : are you guys afk?? [ To BlackRose ] : There is no level below Brainless, So I cannot be "Dumber"
Shift : why do u guys fight? BlackRose : how EVIL of me! BlackRose : rofl you got any other insults? Frost : Yes, It takes a Genius to be evil..
BlackRose : youve been saying that for like 20 mins? Frost : I am learning, and I do not need you to tell me so. Frost : I am learning, this is part of my learning experience. Frost : Apparently someone doesn't know who is embarrassing who. Frost : I am talking to Mania, explaining my reasons for the prize. Frost : If I can't get him to be reasonable, I will take him down with me. BlackRose : but your crying cause im being "mean"
Frost : Please don't mis-conscrew my words, I never said you were mean. Frost : I said you were disrepectful to me today. Frost : Don't get family matters into this BlackRose, unless you want to see. Frost : Good, that means your dying. Frost : Don't you mean Metaphor? Frost : If I'm blind, your losing to a Blind guy. Frost : Yes, I am not rejecting this arguement with "Shut up"
BlackRose : aww is emo kid getting mad? Frost : Maturity? what does insulting my family have with maturity? Frost : it just shows how much of a loser you are. You have been placed in jail by a GM. I got it because it was a rather hard item to get and it was wearable by all class(except novice) which meant it never discriminate anyone. BlackRose suggested a Muffler. Our Conversation, you can clearly see how mature he is. I finally blew a fuse when you talked about my family the second time. Oh look! Something to occupy myself while I leave you alone to your own stupidity! Damn, those kind of people are still on RO. Just make sure you can fix the damage that the guy have done to your server, thanks god he wasn't able to do serious damage on the server, like script-wise or something like that. Also Kozua, wasn't that already learned? how can level 60 GM kick level 100 GM? I thought lower level GM can't do anything to higher level GM? Frost isn't a lvl 100 if I've gathered this correctly. He's a level 60. Given his godawful resume, who'd hire him anyway? 50% his fault for being an idiot, but you also have to take 50% responsibility for making a terrible recruiting choice. Should be more careful when hiring a prospective GM in future - out of 100 applications, I'll generally take on two new staff members at most (sometimes not even two). There's a reason for this. I have to do something to gain anime success so that people can hate me too. Well people can act all goody two shoes in resumes just so they can get power. But I'm sure that their real faces show up soon enough, just like this guy. Yeah, be sure to watch your servers. Oh dear lord, please, I beg of you, don't be one of the server that are hiring him. A person's true colours usually come out when given a position of power. Just like this genius. Hopefully, this thread remains here and should probably be given as much attention as possible so other Admins learn from this mistake. Thankfully, it doesn't sound as costly as it could have been and they got rid of the mongoloid before he caused any more(serious) damage. He told me he wanted to be a bot hunter for the server. I have a feeling that he would probably be the first bot on the server. Thanks for the warning Experience.